For those of you who hadn’t found it by yourselves, I’ve got a new website. 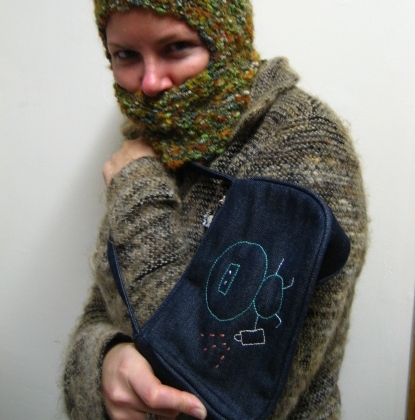 So mosey on over to http://radicalcrossstitch.com and settle on in. Thanks to all the people who’ve continued to read my ramblings for all these years. I assure you the rambling will continue. Victorian State Premier, Steve Bracks has just given a press conference announcing his resignation. He is resigning for personal reasons. He’s prattling on about how good a job he’s done at the moment, but I will update when he talks about actual reasons. UPDATE: He said that he has been pondering the decision for a while but recent events have confirmed the decision. I put my money on Brumby for the next Premier. Unfortunately. Bracks is backing him so the chances are pretty high. The next Leader will be elected on Monday morning at 11am. The Labor Party must be crapping about this. He’s their biggest asset at a state level. And their is no one who immediatly comes to mind as a replacement who has anywhere near the charisma and nous as Bracks does. Apparently DP Thwaites is about to resign too! OK I spent some time dwelling about this one on the bus. I think this is pretty awful news for those of us who care about the environment. At least with Thwaites there, there is someone with a bit of green understandings (even if he is a complete wanker on indigenous issues…). Brumby however, is a numbers man. And unless you’re a Georgist, numbers men and looking after the environment don’t often go together very well. Dunno, what do others think? I reckon I need to have a wee break from posting for a wee bit cause I am SUPER BUSY right now. But I asure you this site is going to get a whole lot more exciting soon. Can you feel it?!? I feel it!!! In the mean time check out Yahweh, what a god. I had tears of joy and pride rolling down my cheeks as I watched the Maori TV coverage of the demo in Tamaki Makaurau yesterday in solidarity with the Aboriginal Nations in opposition to John Howard’s Invasion of Aboriginal Land. Mad props to the two arrested! Awesome action people, and great to see the Te Whanganui e Tara posse are organising and a little birdy told me there is whispers of organisation in Outatahi as well. No ninja girl can be complete without a handbag! The bag is denim with an original hand embroidered design. The bag was rescued from impending landfill doom.